The National Institutes Of Health has developed a new program that's designed to help parents make healthier choices for their kids and themselves. "It's called, 'WeCan! Ways To Enhance Children's Activity And Nutrition,'" Elisa Zied tells The Early Show co-anchor Hannah Storm. The registered dietician and spokesperson for the American Dietetic Association says the program is geared toward parents and caregivers. "One great way to help prevent obesity in young children 8 to 13 years old, emphasize these Go Foods," she says. "Foods you really want to try to incorporate as the main part of your daily intake. That goes for parents as well." Part of the WeCan! 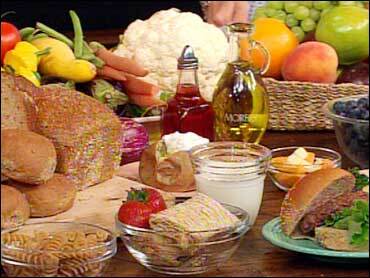 Program includes the creation of three categories for foods: Go Foods, Slow Foods and Whoa Foods. Go Foods are foods that are beneficial to eat almost anytime. They are low in saturated fat and dietary cholesterol. Various fresh vegetables: broccoli, peppers, carrots, tomatoes, etc. Various fresh fruits: apples, oranges, bananas, berries, etc. Slow Foods are foods that should be eaten sometimes, at most several times a week. These are generally higher calorie, higher fat foods that kids are encouraged to eat only sometimes -- so they can leave room for other more nutrient-dense foods. Whoa Foods are foods that should only be eaten once in a while or for special treats. They are typically high in saturated fat and dietary cholesterol and, in some cases, high in sugar. Zied says that with all of these foods it's important to remember to control your portion sizes. For example, low fat cheese may be on the Go list, but that doesn't mean you should eat a whole block of it at once. Always remember that it's not just what you eat, but how much. In a recent study, after three years, children who received behavioral and nutrition education consumed more Go foods, and fewer Whoa foods, than those who did not. They also consumed slightly fewer snack and dessert foods and chose more Go versions of desserts. In addition to encouraging healthy foods and limiting portions, the program also promotes increased physical activity and decreased screen time. One study found that, on average, kids spend about three hours a day watching television, and up to five and a half hours a day watching television and playing video games. Zied says we need to reduce that time significantly and replace some of that time with more physical pursuits. For example, set up an obstacle course at home, play catch at the park, take a walk around the block or at the school sports field. Kids are only getting about 30 minutes a day of physical activity, but they need about 60 minutes a day. Zied says the bottom line is that this program is positive in its approach to obesity prevention in 8 to 13-year-olds, but can help parents and younger and older kids as well. It has an upbeat approach and it's doable. The program aims to empower parents by showing them they can have a strong influence on their children's eating and activity behaviors.